We’re listening! Your feedback is essential to the success of this publication and of OTN in general. If you have comments or suggestions regarding this newsletter or any of the resources for middleware pros available on OTN, please share your thoughts: bob.rhubart@oracle.com. 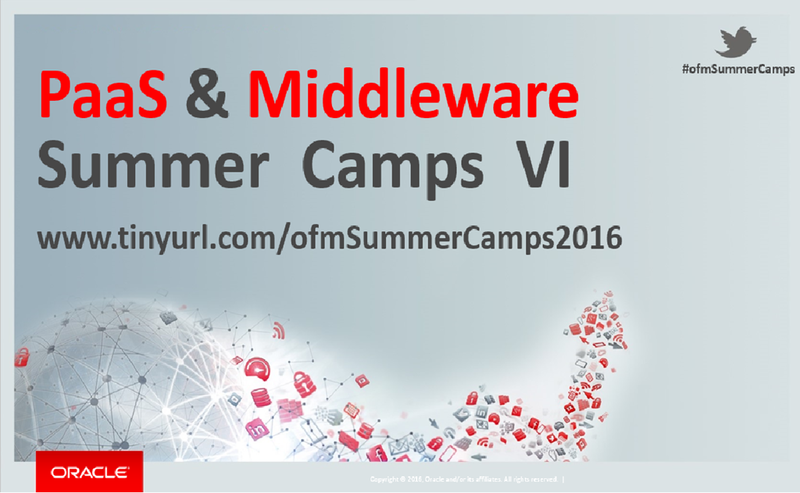 Why you should attend the PaaS & Middleware Summer Camps 2016! You are working on large Fusion Middleware & PaaS opportunities & projects? 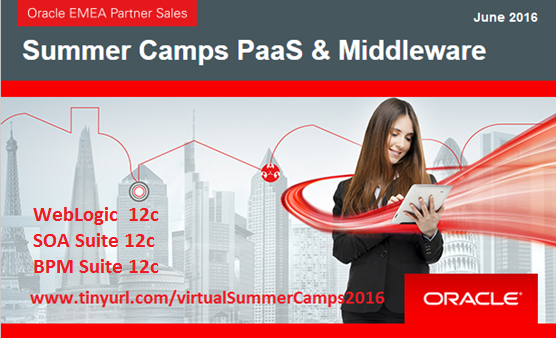 Oracle is pleased to invite you to the PaaS & Fusion Middleware Summer Camps VI . Goal of this 5 days hands-on trainings is to support you to deliver a successful project. Most of the trainers are a member of the Oracle product management team. Registration is free of charge, except in case of cancellation fee € 150 or no-show fee €2000! Please read the registration page very careful before you register – make the right choice for your bootcamp (you can not change later) Please be aware that we will NOT answer questions via e-mail with details you can find at the registration page. Please post them in the discussion forum here! All details are posted at our registration page here. A basic knowledge of ICS & PCS. This presupposes BPM Suite skills. Passed the Integration Cloud Service Presales Specialist and Business Process Management Suite 12c Presales Specialist Print the certificate as a proof to get access to the OFM Summer Camps! Is a member of the worldwide Oracle PTS team. PTS focuses on partner technical enablement – this runs the gamut from technical evangelisation to project support. Niall’s areas of expertise include SOA, BPM, ICS, PCS, IaaS, JCS. He is also the author of the iconoclastic fictional trilogy – The Hare of the Dog Volumes I to III, available on Amazon. BPM Specialist – EMEA Technology Specialist Group. PaaS4SaaS integration: How PCS can be an instrument to extend functionalities of Oracle applications. You are working on large Fusion Middleware & PaaS opportunities & projects? 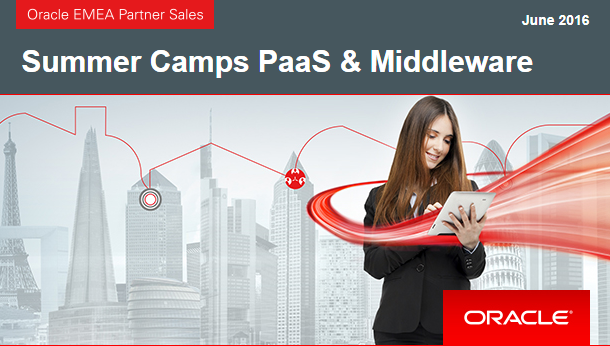 Oracle is pleased to invite you to the PaaS & Fusion Middleware Summer Camps VI by the SOA & BPM and the WebLogic & Developer Partner Communities. Goal of the trainings is to support you to deliver a successful project. Most of the trainers are a member of the Oracle product management team.